Oil Storage Market size in 2017 was over 1 billion cubic meters and is predicted to grow over 3% by 2024. 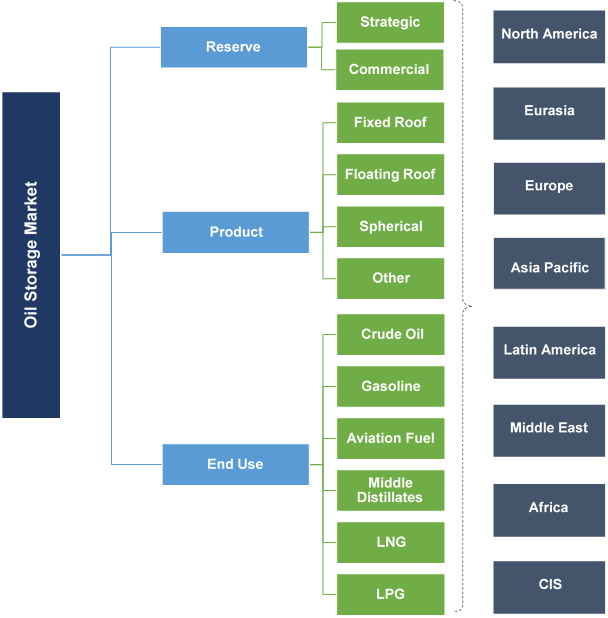 Global oil storage market will witness an appreciable growth on account of continued volatility of oil & gas prices and resultant severe oil glut. The prolonged mismatch between demand & supply with increasing hydrocarbon production, predominantly from Libya, Nigeria and Iran will further complement the industry outlook. The average annual OPEC crude price has dramatically declined from USD 109.45 per barrel in 2012 to USD 52.51 per barrel in 2017. Ongoing investments toward unconventional resources along with declining petroleum import demand from East Asia will stimulate the oil storage market share. For instance, in 2017, the China Energy Investment Corporation announced to invest over USD 83 billion in the development of shale gas across West Virginia. Escalating demand for the expansion and renovation of existing refining storage capacities on account of fluctuating O&G trends will further support the industry growth. Strategic petroleum reserve in 2017, accounted for over 60% of the global oil storage market. These reserves store crude stockpiles supplied by public and private companies for maintaining national security and protecting economy during energy crisis. In 2016, the Government of India announced investment worth USD 767 million to build strategic reserves of 4.4 MT storage capacity in Chandikhol, Odhisa. Growing need to build additional storage capacity to meet expected changes in seasonal demand while mitigating supply disruption will propel the commercial petroleum reserve. In 2017, petroleum product demand across Asia increased from 1,226 MT in 2012 to 1,360 MT. Floating roof oil storage market is set to grow on account of increasing demand for the storage of large quantities of low and medium flash point petroleum products. Ability to effectively minimize the volatile organic compound emissions and product losses will make the adoption of these tanks preferable over other alternates. Emerging demand to store liquified gases including LPG & LNG having extremely low flash points will stimulate the spherical oil storage market. Introduction of stringent government norms to reduce environmental pollution is one of the key factors propelling the demand for LNG, which in turn will complement the industry outlook. Fixed roof oil storage market is anticipated to expand over 3 % by 2024. These units are deployed to store high flash point liquids including fuel oil, kerosene, diesel. Ability to offer additional strength to allow higher storage pressure while minimizing environmental emissions will boost the product penetration. Crude oil storage market is predicted to expand over 3% by 2024. Growing demand for high value-added products on account of rising investments toward infrastructural expansion will fuel the industry growth. Refurbishment and expansion of refining facility will further favor the business scenario. 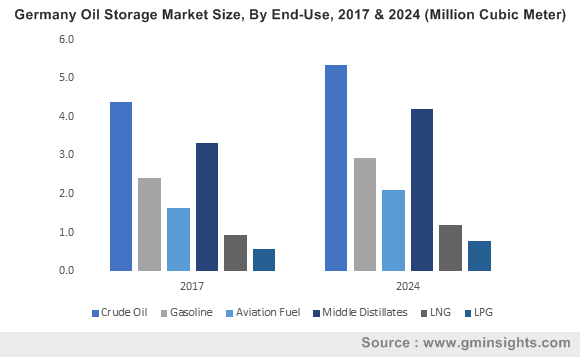 Increasing demand for gasoline from wide array of industries, primarily automobile and power will propel the gasoline oil storage market size. According to Energy Information Administration (EIA), in 2017, the U.S. gasoline consumption has increased by over 1.8% to 9.3 million bpd when compared with 2016. Rapid urbanization along with relatively lower gasoline prices will further strengthen the product demand. Growing middle class base along with new regional connectivity schemes across developing countries will stimulate the aviation fuel oil storage market. China oil storage market will grow on account of increasing capital investment toward the development of storage capacity from foreign and domestic companies. In 2016, the Government of China announced to build additional 441 million barrels of strategic petroleum reserves by 2020. Growing focus toward the expansion of refinery facilities in the country will further complement the business outlook. The U.S. oil storage market, in 2017 was over 80 million cubic meters. Positive outlook toward the development of unconventional O&G fields along with availability of resources including advanced technology and skilled manpower will augment the industry growth. In 2017, according to EIA, dry gas produced from shale accounted for over 60% of the U.S. dry natural gas production. Abundant O&G reserves along with sturdy R&D activities pertaining to the development of hydrocarbon reserves will propel the Russia oil storage market. It has been estimated that the country holds approximately 680 Tcf of reserves in subsoil out of which 3% accounts for shale gas, 15% tight gas, 7% CBM and 75% account for hydrates. The continued growth in the national oil production, with an average daily output of 11 million barrels per day will further favor the business scenario. Notable industry players include Synder, Denali, ZCL Composites, L.F. Manufacturing, Vopak, Superior Tank Company, Tianjin Anson International Company (TICO), CST Industries, Synalloy (Palmer), Elixir, Roth industries, Ergil, Waterford Tank & Fabrication, Sri Ranga Industries and Hydrotherm Engineering Services. Technological advancements and product differentiation driven by sturdy R&D activities are some of the key trends witnessed across the industry. For Instance, CST Industries, in 2016, introduced Edgecoat technology to enhance corrosion protection in glass-fused-to-steel tanks. Oil storage is facilitated by public or private companies to store crude and petroleum product stockpiles to safeguard the economy and maintain national security during energy crisis. Continuous investments toward exploration and production of O&G field along with increasing rig count will stimulate the business outlook. High capital expenditure toward construction of storage facility may act as major constraint.